The school of the Sublime Way focuses on versatility and efficiency. Their students are taught to use many weapons, and to excel in the weapons most suited to their disciplines. Reshar believed strongly that a weapon must be usable in all situations and that a martial adept must use any weapon available. As such, the 'soft' weapons were largely scorned by Reshar. 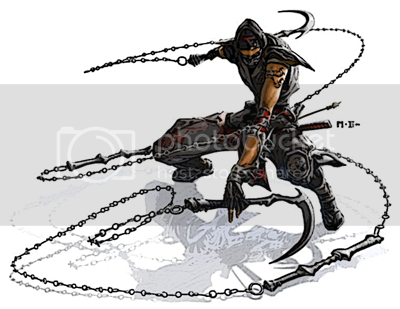 Though masters of Setting Sun could put nunchaku to powerful use, and the spiked chain was a thing to be feared in the most skilled of Shadow Hand adepts, Reshar himself found that the weapons, though potent in the hands of a master, simply did not offer enough to warrant the special training necessary in their use. If warriors were to be efficient, choosing how to spend their time training is crucial - and time spent mastering such a complicated weapon was wasted, thought Reshar, for his vision of a martial adept was one who would not be dependent on any single weapon. Alikarin ahn Tollerria, a friendly rival of Reshar's, disagreed with this decision. He felt, strongly, that the weapons offered opportunities that could not be found with in rigid weaponry, and that training specially in their use could offer rewards to a dedicated student. In many ways, Alikarin did find that Reshar was correct - he spent many decades simply experimenting with the weapons, and never had the success of his friend. He drew few students, because he felt he himself was still a novice. Nevertheless, he persevered, and after many years, his small dojo, though obscure and remote, had succeeded, through the combined efforts of Alikarin and his students, in developing ways of using soft weapons not only with the techniques of the Sublime Way, but also with their own discipline: the Chthonic Serpent. The ways of the Chthonic Serpent rely on throwing one's opponent off-guard, distracting him and ruining his timing, before finally trapping him within the binding chains of their weapons. The weapons associated with the Chthonic Serpent discipline are the Dire Flail, Flail, Flindbar(MM3), Heavy Flail, Kusari-Gama(DMG), Spiked Chain, Tentacle, and Whip. The skill associated with Chthonic Serpent is Use Rope (Dex). Because Alikarin had only succeeded in developing a successful discipline for these weapons by the time both he and Reshar were quite old, Reshar never mastered the discipline and it was never included in his school. As such, it never gained nearly the fame as Reshar's nine, but Alikarin's little dojo lives on, and masters of Chthonic Serpent may be found on occasion. Only Swordsages and Warblades may learn maneuvers from Chthonic Discipline, but most cannot. There are two ways to learn maneuvers from the discipline. The first is to have received prior training in the discipline. A Warblade or Swordsage may start with access to Chthonic Serpent, but doing so means neglecting their training in another discipline. A Swordsage or Warblade may during character creation select one of the disciplines he has access to, and replace it with Chthonic Serpent. That discipline's associated skill is no longer a class skill for the character, and they gain Use Rope as a class skill instead. The other way is to seek out a master of the Chthonic Serpent, one capable of 5th or higher level maneuvers from the discipline. Such a one may train a Swordsage or Warblade in the discipline. Training costs 1,000 XP and takes a month. After the month, the character gains the ability to learn maneuvers from the Chthonic Serpent discipline, and may further swap out any maneuvers he does know at the time for maneuvers from the Chthonic Serpent discipline of the same level. He also gains Use Rope as a class skill. The difficulty of finding such a mentor is left to the DM to decide. First, big thanks to The Demented One and Krimm Blackleaf for their excellent homebrewed disciplines; they inspired this. Also, many thanks to The Demented One for the "replace a discipline you have or go find training" mechanic for gaining access to the discipline - that's brilliant, and I've nicked that here. "Imitation is the sincerest form of flattery"? Certainly intended to be, here. Anyway - I'm pretty newb with Tome of Battle and sort of newish with melee in general. Plus, ya know, Grapple rules. So this definitely needs serious review, and I'd really appreciate it if I could get any. Binding Constrictor: Strike - On a successful attack, start a grapple as a free action that does not provoke attacks of opportunity. Gain +1 to Grapple check per two initiator levels. Maintain Grapple at distance. Coils of Rapture: Stance - If you are smaller than your opponent, all size modifiers for Grapple checks are halved. Allows Grappling of opponents more than two size categories larger than you. Crack of the Whip: Stance - Whips may deal lethal damage, attack lightly armored opponents, take attacks of opportunity, and do not provoke attacks of opportunity when attacking. Flexible Strike: Strike - Strike ignores target's Shield AC. Dance of Chains: Counter - Counter attack with Grapple attempt. Viper Lash: Strike - Attack with 5 ft. greater reach, target is denied Dexterity bonus to AC. Boa Strike: Strike - On a successful attack, start a grapple as a free action that does not provoke attacks of opportunity. Gain +1 to Grapple check per two initiator levels. Immediately deal constriction damage equal to weapon damage +2d6. Maintain Grapple at distance. Careful Chains: Stance - Gain bonus to Grapple checks depending on ranks in Use Rope. Whirling Scythe: Boost - On successful trip attempt before the end of your turn, gain free attack and deal +4d6 damage. Wrap-Around Attack: Strike - Against this strike, target's Shield bonus to AC becomes a Shield penalty to AC. Blurred Bonds: Boost - All threatened targets are denied Dexterity bonus to AC and take a -4 penalty to all checks to resist Disarming or Trips. Death Adder Lash: Strike - Attack with 5 ft. greater reach, target is denied Dexterity bonus to AC. Deals 1 Constitution damage. Rapture Rose: Strike - On successful disarm, throw opponent's weapon at another. Reap What Has Been Sown: Counter - Gain a free trip attempt that does not provoke attacks of opportunity against those who try to close with you. Choking Python: Strike - On a successful attack, start a grapple as a free action that does not provoke attacks of opportunity. Gain +1 to Grapple check per two initiator levels. Immediately deal constriction damage equal to weapon damage +4d6. Way of Ourobouros: Stance - Grapple two enemies at once while dual-wielding the discipline's associated weapons. Whirlwind Lash: Strike - Make a Trip or Disarm attempt against all threatened enemies. This does not provoke attacks of opportunity and enemies cannot attempt to retaliate. Cobra Lash: Strike - Attack with 10 ft. greater reach, target is denied Dexterity bonus to AC. Deals 1d4 Constitution damage. Death's Embrace: Boost - Blinds each foe attacked this turn. Anaconda Crush: Strike - On a successful attack, start a grapple as a free action that does not provoke attacks of opportunity. Gain +1 to Grapple check per two initiator levels. Immediately deal constriction damage equal to weapon damage +6d6. Maintain Grapple at distance. Reap the Whirlwind: Boost - On next successful Trip attempt this turn, gain free full-attack against target. Calamity Symphony: Stance - All of discipline's associated weapons add 5 ft. to their reach and maintain the ability to strike at adjacent squares as well. Against any target completely surrounded by threatened squares, all attacks gain the benefits of flanking. Wrath of Quetzalcoatl: Strike - Attack with 15 ft. greater reach, target is denied Dexterity bonus to AC. Deals 1d8 Constitution damage. Bonds of Jörmungandr: Strike - Crush the life out of your target. Channeling the great constrictor snakes of the jungle, you whip your weapon around your enemy such that it binds him, and you begin to crush him in the tightening vice of chain. As part of this maneuver, you make a single melee attack against an opponent with one of the discipline's associated weapons. If this attack hits, you may immediately make a free Grapple check against him, and if you use Weapon Finesse with this attack, you may substitute your Dexterity modifier instead of your Strength modifier on this and all Grapple checks until the grapple is broken. You also gain a bonus on this check equal to half of your Initiator Level. When a grapple is begun in this way, the weapon used for it may be used to attack your opponent without penalty even if it is not a light weapon for you. You may also make attacks with a weapon in another hand, and if so armed you may threaten squares around you and take attacks of opportunity, though you take a -4 penalty on all attacks against any opponent beside the one you have bound. Alternatively, if the weapon in your other hand is also one of the discipline's associated weapons and can reach your foe, you may wrap both around him, which adds +4 to your Grapple check. You may also maintain the grapple without moving into your opponent's space. Doing so prevents your opponent from damaging you by grappling or from pinning you. However, it also allows him to use non-light weapons to attack you, though he still takes the -4 penalty and may not use more than one. You cannot pin him without entering his space as normal, nor can you take items from him or prevent him from speaking. You are not treated as grappled for the sake of casting spells or other actions that require concentration, though at least one hand is occupied with the task. You know the true way of the whip: where lashes can leave lasting damage, how to handle armored opponents, how to move a whip quickly and strike suddenly, and most of all how to use a whip in every situation. While in this stance, any Whip that you use may be used for attacks of opportunity and does not provoke attacks of opportunity itself. You may choose to deal either lethal or non-lethal damage with a whip, at no penalty. Finally, enemies are immune to your whip attacks only if the sum of their Armor and Natural Armor bonuses are greater than your Initiator Level. Your fighting style takes after monstrous serpents, and your weapon is like an extension of yourself - wrapping, constricting, and crushing your foes. While in this stance, you may grapple targets up to four size categories larger than yourself. Further, if your target is larger than you, all size bonuses and penalties to grapple checks are halved. Your weapons of choice bend and curve, easily allowing you to wrap attacks around shields, ignoring them completely. As a part of this maneuver, make a single melee attack. This attack ignores your opponent's Shield bonus to AC. Your twirling, whirling weaponry is always ready to ensnare an opponent. At any point in which an opponent is about to attack you in melee, you may initiate this maneuver to gain a free grapple attempt that does not provoke attacks of opportunity. If successful, the attack is negated and this grapple follows the rules used for grapples started with Binding Constrictor. Like a rattlesnake glaring down its prey, you coil up, readying yourself - until you suddenly lash out and strike your foe. As a part of this maneuver, make a single melee attack. You may attack a target up to 5 feet beyond your weapon's usual reach. Your target is denied his Dexterity bonus to AC for this attack. As Binding Constrictor, but deal constriction damage equal to your weapon's damage (or the sum of both if using two weapons to grapple) + 2d6. You know how best to use your weapons for binding, and know the forms and the moves to pull off elegant, effective binds. While in this stance, you gain a bonus to Grapple checks based on ranks in Use Rope. Your weapons are always in motion, always ready to strike a foe who presents a weakness. Until the end of the turn, on any successful Trip attempt you gain a free attack, which deals an extra 4d6 damage. Your attacks are so flexible that they can not only avoid an opponents shield - your opponents attempts to use their shield actually hinder their ability to avoid your blows. As a part of this maneuver, make a single melee attack. For this attack, your target's Shield bonus to AC becomes a Shield penalty to AC, reducing it by the same value it normally adds. Spinning weapons become hard to see, hard to predict. You know just how to use this to your advantage. When you initiate this maneuver, all opponents you threaten are denied their Dexterity bonus to AC, and take a -4 penalty on Disarm and Trip checks, against your first attack against them this turn. A sudden blur, a twinge of pain - and the snakebite kills. As Viper Lash, but also deals 1 Constitution damage. Death stalks all, and takes from us everything we have. When initiating this strike, you attempt to disarm an opponent; this does not provoke attacks of opportunity. If successful, you may fling your opponents weapon at another foe. This attack is treated as a ranged attack that deals the weapon's damage. The weapon's range increment is 10 ft., and you may further only target units within a cone beginning at the original owner of the weapon and pointed at you. Your weapons whip and twirl about you, providing an effective shield against attacks. At any point in which a foe is entering a square adjacent to you, you may initiate this maneuver to begin a grapple against them. The python's massive strength is a source of inspiration - and terror. As Binding Constrictor, but deal constriction damage equal to your weapon's damage (or the sum of both if using two weapons to grapple) +4d6. The snake eating its own tail, a sign of infinity, or life and death, or the inherent duality in all things - you have learned to give and take in equal measure, and know how to handle multiple opponents. While in this stance, you may grapple an opponent with any of the discipline's associated weapons without entering their space, as with Binding Constrictor. Further, if you use two such weapons, you may bind two opponents in this fashion at once, as long as both are within your reach. Finally, when using Binding Constrictor, Boa Strike, Choking Python, or Anaconda Crush, you may choose to instead initiate the maneuver as a full-round action, in which case it may be used simultaneously with each hand against two different opponents. You yourself have become as a maelstrom, pulling all with your whirling weapons. When you initiate this maneuver, you may make a single Disarm or Trip attempt that does not provoke attacks of opportunity against each opponent you threaten. The king of snakes stands tall, strikes long. And none caught in its mesmerizing gaze see it coming. As Viper Lash, but may attack up to 10 ft. further than normal with the attack, and deals +1d4 Constitution damage. Cold steel, wrapped around foes, showing them the way to the dark of the grave. When you initiate this maneuver, each foe you successfully damage with a melee attack this turn must make a Reflex save against DC 16 + your Dexterity modifier, or have their eyes plucked out, blinding them. The largest, heaviest snake there is, could squeeze a man's life from his lungs with scarcely an effort. As Binding Constrictor, but deal constriction damage equal to your weapon's damage (or the sum of both if using two weapons to grapple) +6d6. Striking high and low, your relentless blows provide a tempest of death for your foes. After initiating this maneuver, you gain a free full-attack against the next foe you successfully Trip this turn. Great, whirling coils of death surround you wherever you go, the sweet sound of their slicing the air providing a serenade of destruction. While in this stance, your weapon adds 5 ft. to its reach, while maintaining the ability to strike adjacent squares. Further, any foe completely surrounded by squares you threaten (or with squares you threaten on three sides and you yourself on the fourth) is considered flanked for all attacks. This ability does not function if they have a wall or similar on one or more sides, even if you would threaten those squares. As Viper Lash, but may attack up to 15 ft. further than normal with the attack, and deals +1d8 Constitution damage. The Midgard Serpent, the very bones of the world itself, is the source of your strength. Who can help but be crushed under the very weight of the world? When initiating this maneuver, make a melee touch attack to initiate a Grapple. If you succeed on the Grapple check, your opponent takes 4 Strength damage and 4 Constitution damage. You then may make another Grapple check. If you succeed again, your opponent takes another 4 Strength damage and another 4 Constitution damage. You may then make a third Grapple check. If your foe fails this check, your foe is crushed to death, dropping immediately to -10 HP (or lower, if necessary for death). If your opponent succeeds on any Grapple check, your Grapple is broken and the maneuver is over. However, if they succeed on the first check, you will have used only a Standard Action, and may take your Move Action for the round. If they succeed on the second check, you may trade a Swift Action if you have one remaining for a Move Action if you like. If they succeed on the third check, then you have used a Full-Round Action as normal. You may initiate a Grapple with any of the weapons associated with the Chthonic Serpent discipline. Doing so requires a successful melee attack (not touch attack), followed by a successful Grapple check, but does not provoke an attack of opportunity and does not require that you move into your enemy's space. Grappling in this fashion is identical to using the Binding Constrictor maneuver. When using Binding Constrictor, Boa Strike, Choking Python, or Crushing Anaconda, these maneuvers deal an extra +2d6 constricting damage. Chthonic Grip can be used in place of Improved Grapple to qualify for a feat, prestige class, or other special ability. If you already have Improved Grapple when you select Chthonic Grip, you can choose to lose the Improved Grapple feat and gain a new feat in its place. You must meet the prerequisite for the new feat. Choose a Bardic Dance you know, and a Chthonic Serpent Stance you know. You gain the benefits of that Stance whenever you use that Dance, even if you are already in another Stance because of the Martial Dance class feature. You may take this feat multiple times. Its effects do not stack; instead, choose a different Dance with which to associate any Chthonic Serpent stance. No Dance may have more than one Stance associated with it. As a Swift Action, expend an Arcane spell slot in order to gain the Kyton's Dancing Chains ability for a number of rounds equal to the spell's level. Each chain animated with this ability is entitled to a single attack per round, and any one may be used as the your weapon for your attacks, though it can only be used to attack a target within 15' reach of you. A Chthonic Serpent Belt looks like a rattlesnake, and the buckle is an intricate device in which the head of the snake opens, revealing two fangs which can be slid over the beads in the serpent's tail. With the buckle closed, the belt looks much like Ourobouros, the snake eating its own tail. The belt functions as a Crown of White Ravens, except that it features maneuvers from the Chthonic Serpent discipline. It comes in Novice, Scholar, or Master varieties. The Dorokusai, Sublime Kyton - by Saintheart. Could we add Whipdaggers to the favored weapons or is that rolled into whips? Flexible Strike and Wrap-Around Attack seem a little niche and outlying to me. Dance of Chains does a normal grapple, as opposed to your signature grapples the discipline provides. Rapture Rose is just badass, both in imagery and execution. Reap What Has Been Sown's summary says it trips, the full description says it grapples. Death's Embrace is a Viist instead of a Boost. Also, though it may just be a nagging "Fighter's can't have nice things," removing eyes for permanent blindness seems a bit much. Temporary blindness seems more in line. More variety of maneuvers wouldn't be a bad thing in my mind. Advancing Binding Constrictor and Viper Lash are all well and good but there's space to expand, especially in 2nd level, as well as 6th through 8th. Again, very interesting discipline; with a little more polish, it could be even better! As Whip-daggers count as Whips for proficiency and feats, I feel confident in saying that there exists no DM out there who wouldn't allow them to function with Chthonic Serpent maneuvers. They were certainly intended to; I didn't think it was necessary to mention them separately. ...agreed, but I rather like the flavor and it's supposed to be one of the main advantages of soft weapons, IRL. Thoughts on how to turn them into something meaningful? Hmm, I'd considered ditching the Cone thing on Rapture Rose, because it's a little awkward, but I'm glad you think so highly! It's a very cool, very Indiana Jones maneuver. Reap What Has Been Sown: yeah, and neither's especially great. I'll have to reconsider that one. Ahahahaha, "Viist". Clearly my hands were shifted one to the left... until I got to the 's'? Weird. As for permanent Blindness... it probably is not a great thing to be balancing against, but Blindness/Deafness is a 3rd-level spell and Glitterdust is a 2nd-level spell; Death's Embrace is a 6th-level maneuver, and requires a successful Attack and a failed Save, compared to just the Save for the spells. That was the thought process behind it. So... it really is very carefully aligned with the other disciplines. EDIT: Fixed Dance of Chains and "Viist".